House Minority Leader Nancy Pelosi (D-CA) rejected the idea of partially funding President Donald Trump’s border wall in exchange for amnesty for “Dreamers” on Thursday. 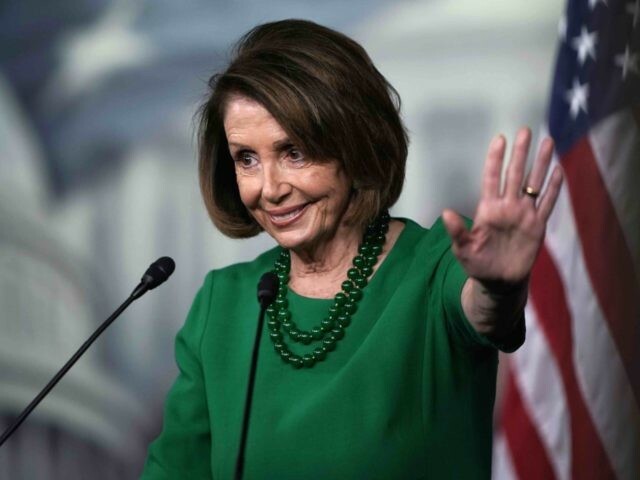 Pelosi — the likely next Speaker of the House after Democrats take control of that chamber in January — made her comments at a press conference Thursday, where reporters asked her whether she would accept “some degree of wall funding” in return for a “permanent, bona fide solution” for illegal aliens who are beneficiaries of the program known as Deferred Action for Childhood Arrivals (DACA). The idea of trading DACA for a border wall has been talked about as the most obvious first step to overcoming the political impasse over immigration reform. But Democrats have continued to reject a deal. In January, Democrats shut down the federal government in an effort to force President Trump to provide amnesty to DACA beneficiaries. Shortly thereafter, in his State of the Union address, Trump described “four pillars” of his proposed immigration policy. These included: 1) legal status for 1.8 million illegal aliens brought to the U.S. as minors, including those who had not registered under DACA; 2) a secure border; 3) ending the visa lottery; and 4) ending chain migration. “These four pillars represent a down-the-middle compromise,” President Trump told Congress at the time. But Democrats rejected those terms, favoring the broadest amnesty possible — including for illegal aliens who broke the law willfully as adults — without a border wall. Pelosi’s stance on Thursday is a sign that Democrats are in no mood to compromise with the administration on immigration after winning the House in the midterm elections. It also bodes ill for deal-making in general, as radical Democrats talk about impeaching the president.